What Is Xylene Chemical Storage? Xylene is a mixture of three different forms (isomers) of xylenes (meta-xylene, ortho-xylene, and para-xylene) and ethylbenzene. The ethylbenzene content of xylene is typically less than 20 percent (m/m). Appearance of xylene is a colorless, flammable liquid with a distinctive sweet odor. See below to learn more about xylene, the hazards associated with the flammable liquid and safe storage methods. Xylene can be found in a variety of end products including paints, aviation gasoline, varnishes, inks, degreasers and even in solvents for gums, resins and rubber. Often used in the manufacture of insect repellents, leather goods, plastics, pesticides/insecticides, and other chemicals. Inhalation: Irritation of the nose and throat is possible. Xylene can harm the nervous system. Symptoms may include headache, nausea, dizziness, drowsiness and confusion. Severe exposure can cause unconsciousness. Ingestion: If large amounts are ingested xylene can harm the nervous system; symptoms include headache, nausea, dizziness and confusion. Aspiration hazard. May be drawn into the lungs if swallowed or vomited, causing severe lung damage. Death can result. Skin Contact: SKIN IRRITANT. Xylene can be absorbed through the skin; moderate to severe irritation may occur. Symptoms include pain, redness, and swelling. Effects of Long-Term(Chronic) Exposure: Xylene can cause dry, red, cracked skin (dermatitis) following skin contact. Exposure to this chemical and loud noise may cause greater hearing loss than expected from noise exposure alone. Can harm the nervous system. Flammable Properties: Flammable liquid – can ignite at room temperatures, and by static discharge. Avoid open flames, sparks, heat and other ignition sources. Extinguishing Method: Use dry chemical fire suppression including dry chemical powder, foam or carbon dioxide. Water is not effective for extinguishing a fire; as it may not cool the chemical fire below flash point. Incompatible Materials: Strong oxidizing agents and nitric acid. Xylene chemical storage by US Chemical Storage. 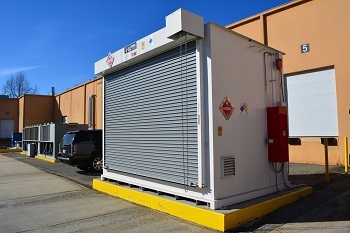 Xylene must be stored in a cool, well-ventilated area that is away from direct sunlight, heat or other ignition sources. Mechanical ventilation is important to rid any toxic fumes or vapors from your chemical storage building, while storing xylene or like chemicals. Electrically bond and ground containers when storing and/or transferring. Keep storage amount to a minimum and clear of any combustibles or flammable materials. When storing incompatible materials, ensure they are segregated and stored separately with a solid partition wall. Contact US Chemical Storage online or call 1-800-233-1480 for a free chemical storage consultation today. 1. Canadian Centre for Occupational Health and Safety. Xylene (mixed isomers); Fact Sheet. , May, 2015. 2. U.S. Dept. of Center for Disease Control. Occupational Health Guideline for Xylene. September, 1978. 3. California Department of Health Services. Hazard Evaluation System and Information Service. Fact Sheet. October, 1989.